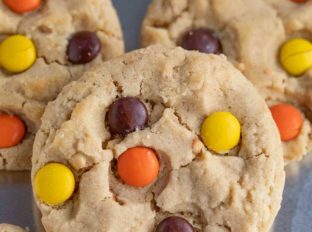 Reese’s Cookies are soft, chewy, and PERFECT chocolate peanut butter cookies made with Reese’s pieces candies ready in only 20 minutes! If you love chocolate and peanut butter together you will love these Peanut Butter Cup Cookies, Peanut Butter Cookies and my personal favorite Buckeye Brownie Cookies which are a cross between Buckeye Balls and Brownie Cookies in the best possible way. Reese’s Cookies can be confusing if you’re just thinking of the title. 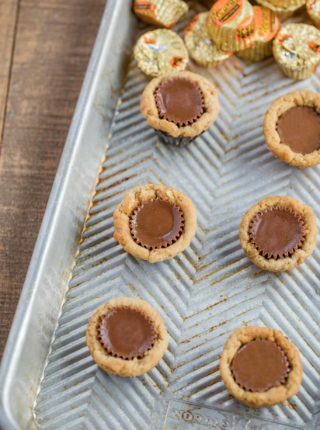 You may think these are like my peanut butter cup cookies with a peanut butter cup pushed into the middle of a peanut butter or sugar cookie that was baked into a mini muffin tin. Those are absolutely delicious! (and linked above, so definitely make those too!) but, these are made with Reese’s pieces candies…aka Reese’s m&ms. If you are a fan of my Chewy Chocolate Chip Cookies and you’re a fan of M&Ms you will absolutely love these cookies. These are a fun option for when I’m looking to make an easy chocolate peanut butter cookie in the easiest and quickest way possible. My backup option (other than the peanut butter cup cookies) would be making my classic chocolate chip cookies and using half peanut butter chips in place of chocolate chips. That is one amazing cookie too. CAN YOU FREEZE REESE’S COOKIES? You can place fully baked cookies in an airtight plastic ziplock bag and freeze for 2-3 months. Defrost on the counter for a few hours before eating. This cookie dough also freezes really well. Just scoop the dough onto a baking sheet, and freeze for about an hour. Then transfer the dough balls to an airtight container, using parchment paper between each layer. When you’re ready to bake, you can place the frozen cookie dough right onto a baking sheet. Preheat oven to 350 degrees F, and bake for 12-15 minutes. Because the dough is frozen they will take an additional few minutes to bake. They may also be less wide as they bake because they will take shape before the centers have fully defrosted. If you’d like your cookies to be shaped normally be sure to defrost the dough fully in the fridge before baking. HOW DO YOU KEEP HOMEMADE COOKIES FRESH? Keep your homemade cookies fresh by storing them in an airtight container at room temperature for about 2 weeks. I like to store with a piece of bread in the container to absorb excess moisture too. You can also bake the cookies for 3-5 minutes, just to warm them up and make it feel like they just came out of the oven for the first time. HOW DO YOU MAKE OATMEAL REESE’S COOKIES? To make this an oatmeal Reese’s cookies recipe, bring the all purpose flour down to 2 cups, and add 3 cups of quick cooking oats plus 2 teaspoons of cinnamon. Preheat oven to 375 degrees F and bake for 8-10 minutes. CAN I REPLACE BUTTER WITH SHORTENING? You can substitute one cup butter with one cup shortening for this cookie recipe, but if you’re short on butter I recommend trying to at least split the fats to half butter and half shortening. Butter adds a lot of flavor and chewy texture to the cookies, and also helps keep them soft by adding a lot of moisture. So while you technically can just use shortening, the butter will give you a better tasting cookie. CAN YOU MAKE REESE’S COOKIES WITHOUT BROWN SUGAR? 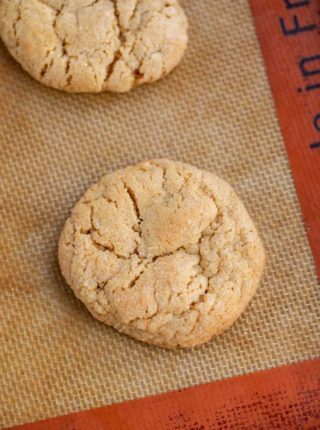 You can remove the brown sugar in this cookie recipe and replace it with granulated sugar, but your cookies may lose some of their chewy texture and instead get a crunchy texture. The brown sugar adds a lot of moisture compared to granulated sugar, making them softer. Make sure to refrigerate for the time that is called for or your dough will spread too much while baking. You need to give the butter a chance to firm before baking. Use an ice cream scoop to ensure even cookie size. You can use other candy instead of Reese’s Pieces with this recipe. Try peanut butter chips, mini Reese’s peanut butter cups or even full sized peanut butter cups that you’ve chopped into smaller pieces. 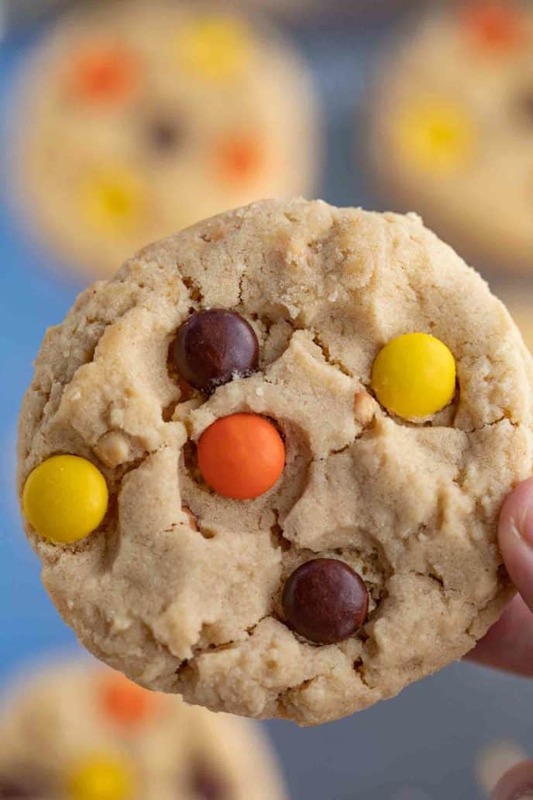 Try this recipe with peanut M&Ms for a peanut butter flavor. If the dough is sticking to your hands when you roll out the flour, you can dust them lightly with all purpose flour. Two large eggs can be replaced by two medium or extra large eggs, or three small eggs in this recipe. If you don’t have a stand mixer, you can use an electric hand mixer or a whisk, just be sure you cream the butter and sugar together until it is light and fluffy before adding in the flour mixture. You can make these cookies less chewy and more crunchy by adding a few minutes to the cooking time. Watch them closely to make sure they don’t burn, just look for a deeper golden brown color. Be aware the longer they cook the more the candies will crack. Make sure to line your baking sheet with parchment paper or silicone mats, unless your sheet is non-stick, but even then I still line them just in case. 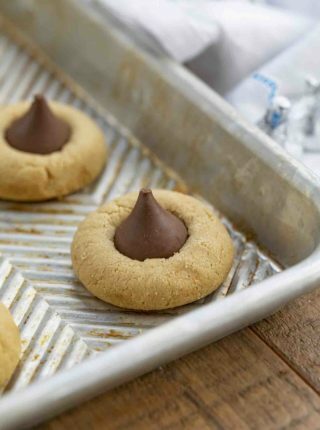 Use an oven thermometer to make sure it’s heating right if you find that your cookies are coming out over or undercooked when making these recipes. Once you have your cookies scooped out into balls, place a few Reese’s Pieces top before baking. 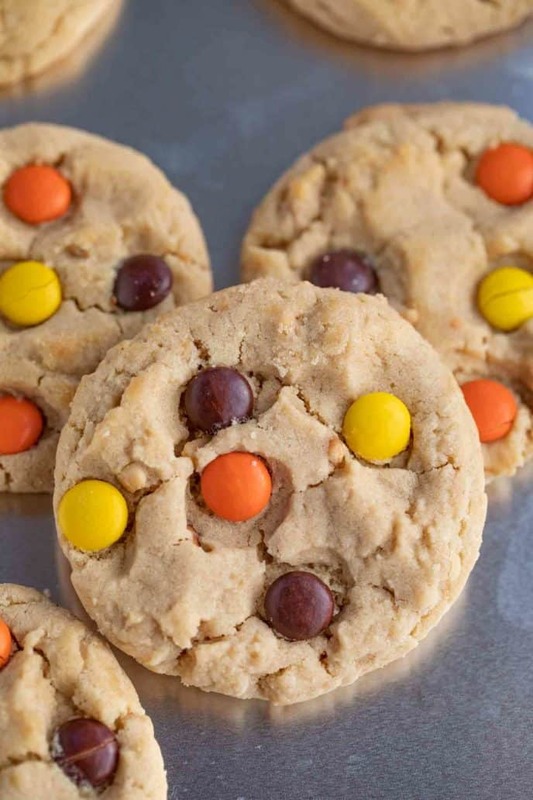 If you want to make this the ULTIMATE Reese’s Cookies make a chocolate cookie batter then add in the Reese’s Pieces candies for an even more indulgent candy cookie. Reese's Cookies are soft, chewy, and PERFECT chocolate peanut butter cookies made with Reese's pieces candies ready in only 20 minutes! To your stand mixer add the butter, peanut butter, brown sugar and sugar and beat until light and fluffy before adding in the eggs one at a time. 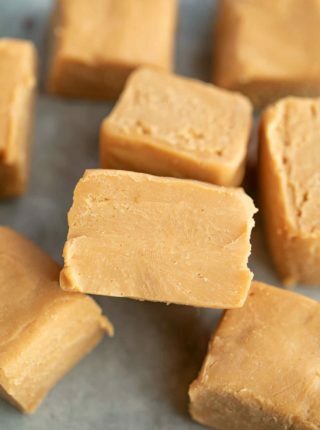 Add in the vanilla, flour, baking soda and salt until just barely combined on low speed then fold in 1 cup of the Reese's pieces with a wooden spoon. Refrigerate the dough for an hour then scoop 2 tablespoon sized cookie dough balls and press in the remaining half cup of Reese's candies into the top of the dough balls and bake at 350 degrees for 10-12 minutes. These cookies are my favorite! I just love the chocolate peanut butter combo! It’s like a match made in heaven. Sounds like a fun idea! Oh my … YUM! A batch of these would not last long here at my house. I love these more than regular M&M’s cookies! These are my favorite!! 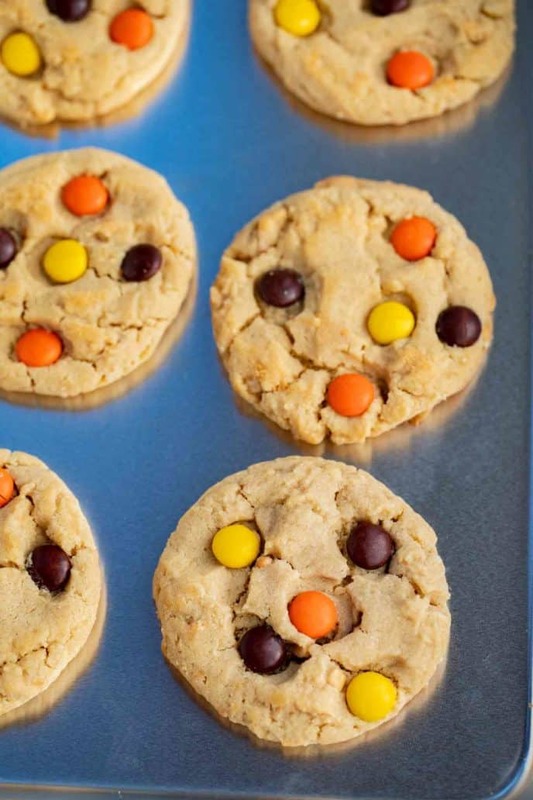 I love reese’s, so to add them in a cookie is even better! They are so soft! Reese’s are always a great idea! So glad you love them too.